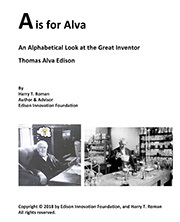 The following sites are fan’s of Thomas Edison, from his inventions and innovations to his work ethic. Give these sites a visit and see how they have been inspired by Thomas Edison. InventorsDigest – Inventors Digest fosters the spirit and practice of innovation. Inventors Digest is committed to educate and inspire independent and professional innovators. NJTEA – New Jersey Technology Education Association – The mission of the New Jersey Technology Education Association is to foster the development of technological literacy through Technology Education programs in the state of New Jersey. Oregon Museum of Science and Industry – The Oregon Museum of Science and Industry (OMSI) is a scientific, educational, and cultural resource center dedicated to improving the public’s understanding of science and technology. OMSI makes science exciting and relevant through exhibits, programs, and experiences that are presented in an entertaining and participatory fashion. eGFI – Created by the American Society for Engineering Education (ASEE). eGFI is committed to promoting and enhancing efforts to improve K-12 STEM and engineering education. TryEngineering.org – A resource for students, their parents, their teachers and their school counselors about engineering and engineering careers. Chemical Heritage Foundation’s Blog: Periodic Tabloid – Edison’s favorite subject was Chemistry. We think he would be a big fan of Chemical Heritage Foundations blog. Edison Biotechnology Institute – Ohio University’s Institue named after Thomas Edison. Thomas Edison’s Birthplace – Thomas Alva Edison was born in Milan, Ohio, in 1847. The Edison Birthplace Museum features a collection of rare Edisonia, including examples of many of Edison’s early inventions, documents, and family mementos. The Birthplace is open February through November and is located at 9 Edison Drive in Milan, Ohio. Thomas Edison’s Historical West Orange Labs & Glenmont Home – Imagine your day ending at sunset. Life without music, motion pictures, radio. Life without light itself. Our modern lives began at the turn of the century in West Orange, New Jersey. 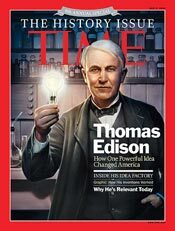 The Laboratory and home of Thomas Edison, stopped in time, continue to teach a new generation. 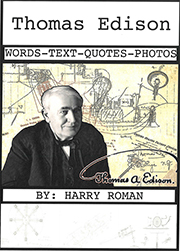 Are you a fan of Thomas Edison? 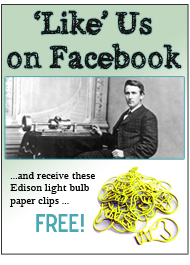 If you have a website that is inspired by or is related to Thomas Edison let us know!